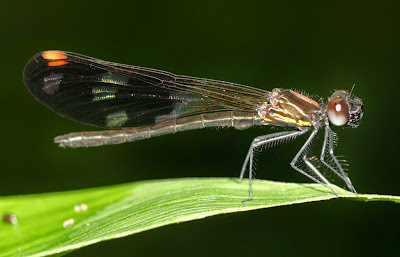 Aristocypha fenestrella is one of the odonate species with wide range of altitudinal distribution (0-1700 m). 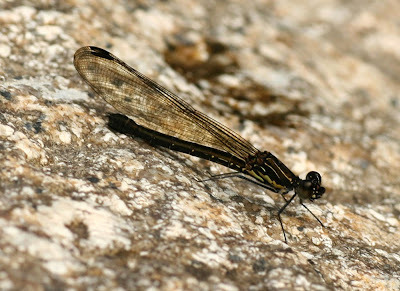 It is one of several common mountain stream damselflies and widespread species. They are small glittered damselfly with broad violet wings. 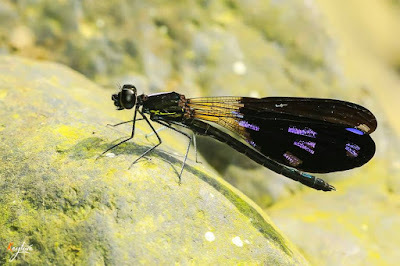 The body of male is deep black basically with some yellow stripes on thorax and a particular triangular purple marking on dorsal of synthorax. Head is uncoloured black in both male and female with the swollen clypeus as characteristic of the family. Fore wings are narrow, hyaline and some how brownish and hind wings are much broader, with shining violet cell areas insert into dark background. Wings of female just are hyaline or hyaline-brownish. Legs of mature male are very typical with tibia developed to be broader and white coloured. The colours of teneral males usually are fader than it of mature forms. Those damselflies usually are found in the primary forests, the mature forms fly around their breeding sites which are clear, swift streams. Although they are forest species, this species is quite common, they are widespread species and could be found in whole of the country. It is one of the most active species of the family with and males are strict territorial individuals. Each male usually appropriates a micro-habitat (a rock, floating timber or a branch of tree..) near the water surface. And when another male enters his territory, rival flying dance will be observed. In courtship flying dance of male and female, or rival flying dance of males, the male usually stay-flies in the air and shows his flash violet hind wing and white tibia of his legs to the partner. A territorial flying between two males take place from some second to many minutes. Larvae of the species live in sand, gravel swift streams; they are very typical with two long filament gills at the end of abdomen.